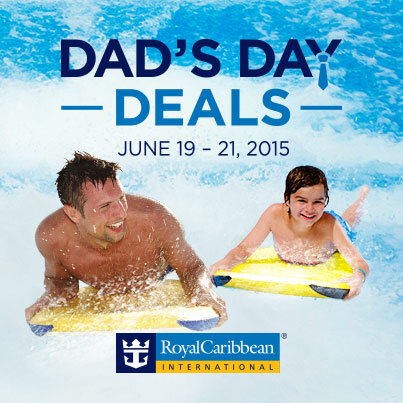 In honor of Fathers Day this weekend, Royal Caribbean is kicking off a Weekend WOW sale that offers a deal on cruises booked this weekend. This discount is on top of the 30 for 30 sale, where guests can get 30% Off Suites & Balconies, 20% Off Ocean View staterooms & 10% Off Interior staterooms. The deal is valid on all sailings departing on or after July 19, 2015, excluding China departures. Offer applies to new bookings made Jun 19-21, 2015. Offer is combinable with current standard/full fare rates, restricted rates (for example, Seniors, Residents, Military, BOGO), Next Cruise offer, 30-for-30 Sale, and Anthem Upgrade Offer. Offer is not combinable with any other offer or promotion, including, but not limited to, Interline, Travel Agent, Travel Agent Friends and Family, weekly Sales Events, Net Rates, Crown & Anchor Discounts. Offer available in the United States and Canada.